Newly available to own on DVD from Warner Bros. Home Entertainment is the budget-priced collection Looney Tunes Musical Masterpieces. Though all of the 18 assembled cartoon shorts have appeared on previous, more-comprehensive releases, those looking for a sampler will likely consider this a great option. As the title suggests, music is the unifying theme to this particular compilation (see full content listing below). Plenty of bonus material (also repurposed from earlier releases) has been carried over, adding considerable extra value to the disc. The shorts run over two hours on their own, but the commentaries and featurettes will keep viewers busy for a while. The lineup of classics – featuring, of course, the likes of Bugs Bunny, Porky Pig, Elmer Fudd, and the rest of the Looney Tunes gang – speaks for itself. Five of these toons were nominated for Academy Awards: “Rhapsody in Rivets” (1941), “Pigs in a Polka” (1943), “Rhapsody Rabbit” (1946), “High Note” (1960), and “Nelly’s Folly” (1962). Older viewers who haven’t invested in previously-released DVD compilations will find plenty of great information in the 13 commentary tracks. Younger viewers will almost certainly be content to just watch these timeless animated shorts over and over again. 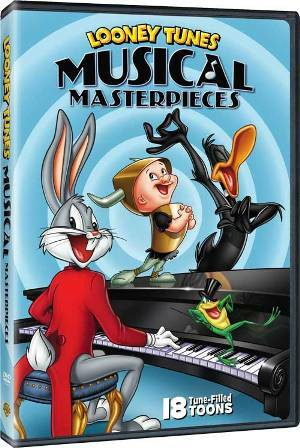 There are five “Behind the Tunes” featurettes included: “It Hopped One Night: A Look at One Froggy Evening,” “Wagnerian Wabbit: The Making of What’s Opera, Doc?,” “Merrie Melodies: Carl Stalling and Cartoon Music,” and “Sing-a-Song of Looney Tunes.” Furthermore, there are commentaries and alternate audio tracks available for most of the collected shorts. Finally, Looney Tunes Musical Masterpieces has trailer for two other Warner Bros. Home Entertainment releases: Looney Tunes Platinum Collection and Peanuts 1960s Collection.